Last week I made it to the North Carolina Museum of Art in Raleigh for the first time. The museum has a really nice permanent collection and a 164-acre museum park with lots of outdoor sculptures along its walking paths. 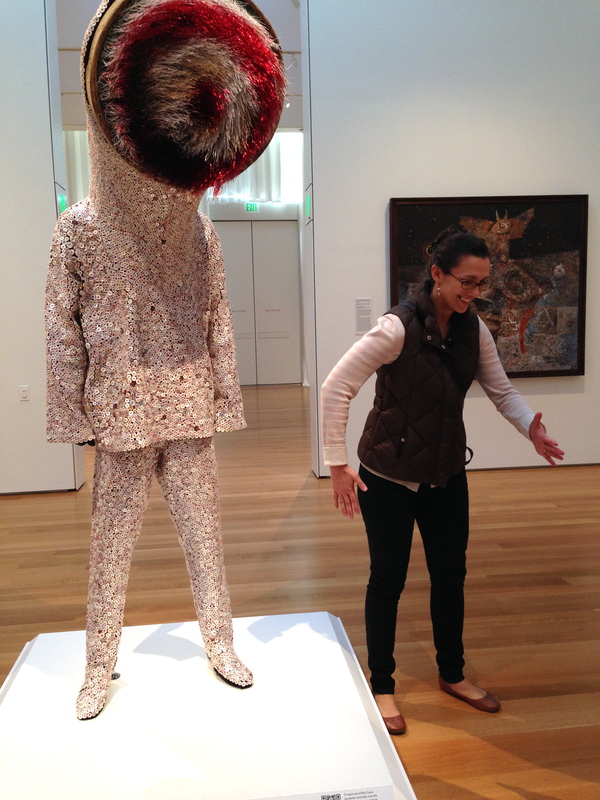 My wife loved this sound suit by Nick Cave. I would say it was one of my favorite pieces in the collection as well. I would pay a lot of money to see her run around wearing this. On a much smaller artistic scale…I installed 16 paintings in a hip little coffee shop in downtown Durham called Respite Cafe. Thanks to a friend, I’ll have my work for sale there for a couple of months. Respite is a fairly young business that just celebrated its second year. They have some really great coffee, as you might guess, but they also have some pretty great cakes and sweets too. I am grateful for the opportunity to hang my work and am anxious to get feedback. Its really cool that Respite is offering a place for local artists to get some exposure. I am one of several artists that they will feature over the course of the year. If you are in Durham, check it out. That’s where I saw your work and got your card! I was particularly drawn to the birdhouse “Don’t Leave”. Really enjoyed your work, felt like it had more substance than the work you usually see in coffee shops. Keep up the great work! Thanks, Ann! Respite has been a great venue for me to get some feedback. I actually found you on IG a few months ago and I really dig your work too. I had no idea we were in the same part of NC. Really cool!